Books: Koi Doosra Naheen, Na Seemayen Na Dooriyan, No Other World: Selected Poems, Aaj Aur Aajse Pehle etc. Kunwar Narayan is one of those poets of Hindi language who has been relentlessly contributing to the Hindi literature since the last six decades and more and this owes to his title as the living poet. He has been awarded numerous prestigious awards by the Indian Government and various literary societies in acknowledgment for his magnificent works. All his poems and writing are influenced by the new poetry movement and he is known for extremely polite and unique style of writing poems. Kunwar Narayan has been influencing the readers right from his first poetry collection that was titled as Chakravyuh and was released in 1956. He has been involved in a great number of inspiring works and is known to have inspired millions through his writings and poems. His domains of writing included Poetry, Novels, Epics, Mythology, History, and Criticism. The living poet in Hindi took birth on 19th September 1927 in the Faizabad district of Uttar Pradesh. He took up Literature as his subject for graduation from Lucknow University. He completed his graduation in the year 1951. He owes his unique writing style to his visits to various European countries and getting exposed to some of the great poets of the time. Some of the great poets that Kunwar Narayan came in contact with on his visits to Russia, Europe, and China include Nazim Hikmet Ran, Pablo Neruda and many more. He was also involved in the translation of some of their writing, especially the writings of the French writers and poets which served as the primary inspiration for his subsequent works. Consequently, Kunwar Narayan took up writing as his profession and proved to be immensely inspirational for all other poets through his wonderful writings. The leading Living poet legend is also known for his variety of writing genres and effective writing style in all the adopted streams. The living poet in Hindi started his writing career through the poetry collection Chakravyuh. He came up with his second poetry collection in 1961 which was titled as Parivesh: Hum-Tum. Until then he had also contributed to a number of multi author writings like Yug Chetna and Tisra Saptak. Kunwar Narayan went on to explore the fiction loving side of his writing career and published his first short story collection Akaron Ke As Pas in 1971. He is known to give place to all social and political issues through his writings. His writings, through a polite tone, have been inspiring all the leaders owing to the high-value content and the morale filled in them. All credits to the great writing style of the living poet in Hindi, his works are considered to be the treasures of Hindi literature. His latest writing released in 2008 in remembrance of one of his previous works and was titled as Vajashrava Ke Bahane. 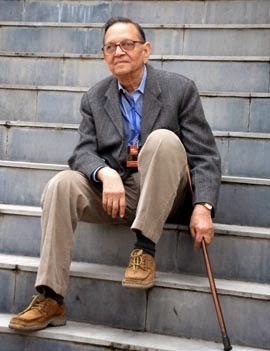 Some of Kunwar Narayan’s notable works include In Dino (poem), Apne Samne (poem), Atmajayi (epic), Aj Aur Aj Se Pehle (criticism), Mere Sakshatkar (criticism) and a number of compilations and translations of some great works by other poets. The living poet in Hindi was bestowed with a number of awards and titles due to his immensely popular and inspiring writings. 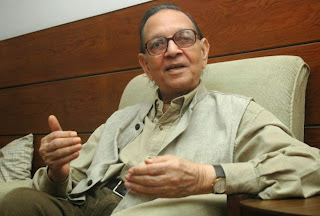 Some of the great awards that Kunwar Narayan received include Hindustani Akademi Award (for Atmajayee in 1971), Kumaran Asan Award (for Apne Samne in 1982), Tulsi Award (for Apne Samne in 1982), Hindi Sansthan Award, Sahitya Akademi Award (overall contribution), a medal from Warsaw University, Poland, Jnanpith Award (in 2005), Padma Bhushan (in 2009), Pune Pandit Award and a lot more. Kunwar Narayan has held a number of significant positions in various bodies pertaining to literature in the country. The leading living poet legend has also taken part in a number of International Literary Events and this has helped in the expansion of his fan base beyond the country borders as well. Through his works, the living poet in Hindi has successfully shed some light in the unexplored regions of mythology, politics, history, and religions. This venture of his in these new domains, equipped with a strong knowledge and word power has helped Kunwar Narayan to come into limelight and gain recognition. His writings have inspired many and still continue to inspire others in terms of teaching them ways of life, deal with intricate political issues and how to inculcate values in daily lives. Kunwar Narayan will be considered as one of the greatest poets of all time in Hindi literature for centuries to come.